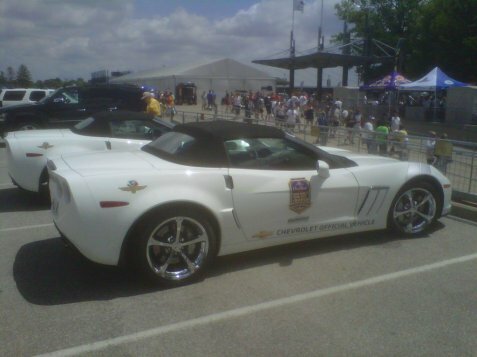 When we were invited to join the folks at Crown Royal to be their guest at the 2012 NASCAR Crown Royal Brickyard 400, we knew it was going to be an incredible experience. Our first day at the track today was very enlightening, as we ate a hardy breakfast at the Crown Royal motorcoach, took a spin on the famous track in an Indy pace car starting from the south pit, enjoyed the fan experience with music and games, checked out the Indianapolis Motor Speedway Museum, and saw the pre-race spectacle from behind the scenes. For anyone who hasn’t been to an IMS or a NASCAR race, I can tell you first-hand that television does this sport little justice, as there is an energy at the track that is obviously invigorating, and today was just the qualifying race. Can’t wait until tomorrow for a full day of NASCAR while enjoying some Crown Royal with my friends from other digital / social media outlets and taking it all in. Stay tuned for more!